Phinda Private game Reserve, Luxury Safari Lodge, Kwazulu-Natal, South Africa. Phinda Mountain Lodge an exclusive South African Safari destination. Each of the 20 private suites at Phinda Mountain Lodge feature spacious en suite bathrooms, sitting areas and spectacular viewing decks. Between exciting game-drives, birdwatch from the pooldeck, or simply relax in the lodge’s comfortable sitting area with its great vaulted ceiling and enormous fireplace. Scenic African safari lodge: With wrap-around views of the spectacular Ubombo Mountains and the South African bushveld below, Phinda Mountain Lodge is set apart from other safari lodges due to its dramatic location. Observe the serenity of the South African wilderness from your private deck, surrounded by the indigenous trees and shrubbery of the pristine Zululand bushveld. Each suite features a comfortable sitting area below the large beds. Paved pathways lead down the mountainside from the main guest areas to the spacious suites – a subtly executed blend of avant-garde and ethnic design. Delicious Pan-African cuisine is enjoyed in the dramatic boma (outdoor dining area) illuminated by dozens of candles and lanterns, or served to you in a spectacular clearing in the bush under a star-studded sky. Phinda is renowned for wonderful bush banqueting in surprising settings. 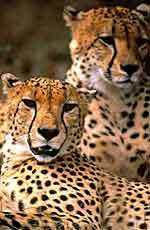 Phinda’s unparalleled safari experiences: Little can compare to Phinda’s exciting range of safari activities. Apart from the twice-daily game-drives, nature walks, riverboat cruises and canoe trips along the Mzinene River (available at no additional cost), Phinda also offers a range of optional thrilling Indian Ocean adventures from scuba diving and deep-sea fishing to spectacular air safaris. Last revised: October 30, 2007.